Yowsa! I've enjoyed squeezing in a few non-quilting projects in the last week or so. My sewing room (aka The Clubhouse) is thinking about leaving its ugly duckling stage and becoming more of a swan. It's nice to be surrounded artwork that I love. These shelves help keep tools within reach as well. The cans will eventually be wrapped in colorful paper. I was inspired by someone else's craft caddy project, but I can't find it now. Calendar from Rifle Paper Co. Work like a captain, play like a pirate print from Monorail Studio. That's as much as of The Clubhouse that I'm prepared to show right now. (The rest of the room is a disaster.) Just know that it's in the works. In terms of sewing, I suppose I really only have one quilt and a block going. The rest are all in my mind. 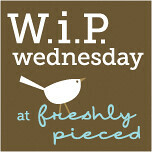 I'm linking up with Freshly Pieced, Sew Much Ado, and Someday Crafts. Nice transformation! I love your sewing machine table...all those drawers!! Your quilt is looking lovely as well, and i really like the fabric in you rose star block. Wow! 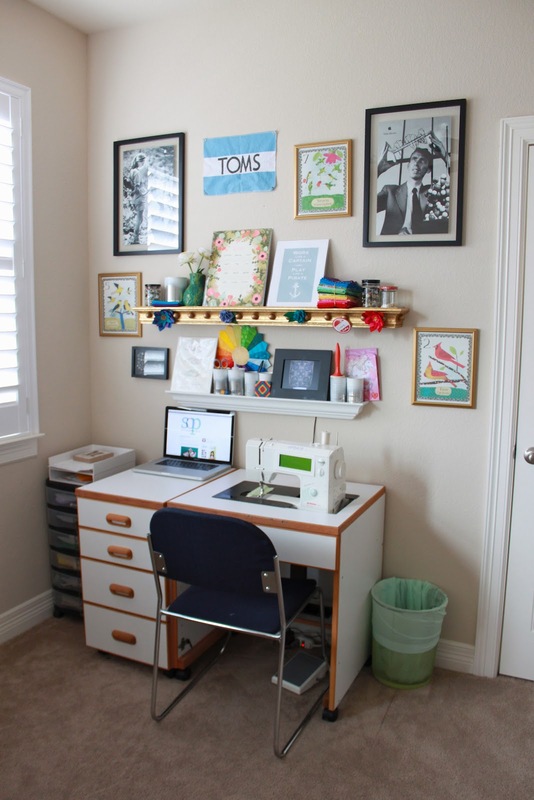 That's a great sewing room! Congratulations! The storm at sea quilt is beautiful. Love the design and the colors! I love shelves..I need more shelves! Get on with your storm quilt cos I love it! The new look is great! Oh my, if I listed all of the projects that are just "figments of my imagination".... I'm sure your list could go on as well! So pretty! 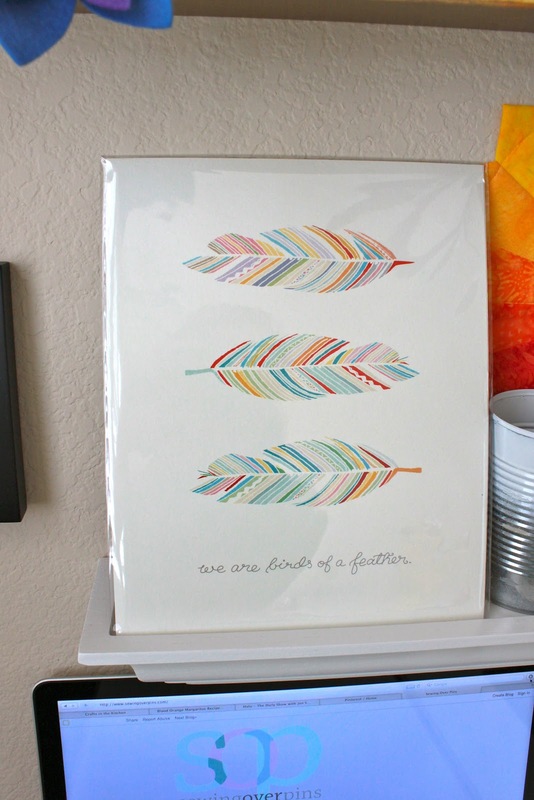 I love the shelves and the art - especially the feather print! Thanks so much! I'm glad you reminded me, too. 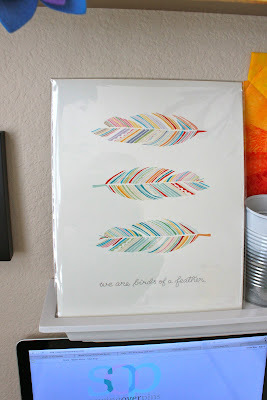 The feather print is by Satchel & Sage at satchelandsage.etsy.com. The "Work like a captain, play like a pirate" print is from Monorail Studio at monorail.etsy.com and the calendar is from Rifle Paper Co.
What a lovely sewing space! It's bright, colorful and unique. I love it!! !